UK broadcaster BskyB is investing a further $400,000 into Californian company Jaunt, an immersive video startup that specialises in cinematic virtual reality. Sky pumped $350,000 of investment money into the startup last year, but has more than doubled that with the latest round - clearly it sees a bright future in VR entertainment. Jaunt's tech offers immersive worlds of 360 degree 3D video and audio, creating some potentially awesome uses for virtual reality in TV and movies down the line. However, BSkyB told TechRadar that it currently has "no plans" for anything in particular right now, and that it's merely looking into the possibilities that the technology can offer. "These investments provide Sky with additional insight into developments within the field," said BSkyB in a statement. A VR version of Ross Kemp on Gangs is currently TBC, but we live in hope. 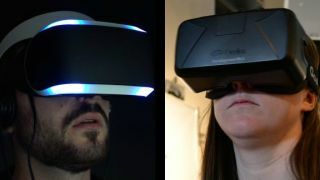 The rise of VR devices like Oculus Rift and Sony's Project Morpheus have attracted a lot of interest in virtual reality, some of which will lead to experiences well beyond gaming, as Jaunt and Sky's relationship is testament to. Samsung is also believed to be readying a headset called the Gear VR that will work with smartphones, the interface for which leaked out last week.